This might be user error, but I can't get any of the Kong apps to work in BM3 via IAA. Is there a trick to this or are they simply not supported? The iMS20 and iPolysix are loading but I can't get any audio. Even when I play directly from the app interface, there is no audio. As far as iElectribe, it does not even load. Any help would be appreciated. Start the apps before connecting them to BM3. That solves most of the issues with IAA apps. thanks for the reply. I actually tried that earlier, but has soon as I load the apps in BM3, audio disappears. I can't get any sound either playing from the app directly or from BM3. On their own, the apps work fine. Those 3 apps are among those I extensively used for sampling during the beta without any issues?! I'm on iPad Air 2, iOS10.3.2. Weird.....what are your settings in the Kong apps? I have background audio ON. Anything else I might be missing? Those apps work just fine on their own and in GarageBand, but as soon as I try to launch BM3, the audio is gone. Same specs as Samu here, been unable to get electribe working here either, will try again when at iPad. BM3's IAA implementation can be quite shaky at times and IAA's in general can be a bit 'quirky'. Hopefully Korg will step up their game and add AUv3 support at some point. It is however also possible to load the apps in AudioBus and add BM3 in the AB output slot and then use the AB Plug-In in BM3 on one of the pads to get the sound thru. (So if one method doesn't work there's always a work-around even if it's not optimal at all times). Generally I prefer to use the export features when possible for 'sound transfer' between apps instead of 'recording'. But since it's working 'smoother' with other hosts the core problem is in BM3's IAA implementation. Are you selecting Gadget in the midi output option using the 3 vertical line dots to the right of the bank letter for IAA? 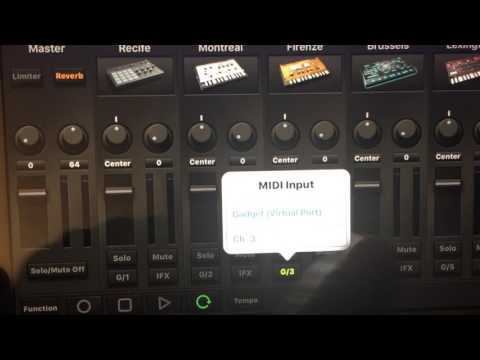 Got iELECTRIBE iPhone version to work agree with ipoly6 and iM20 no joy after selection correct midi settings no sound. I have a similar issue trying to use Korg Module, Gadget and iPolysix. Apps will produce sound, but cannot be played from beatmakers Keyboard, nor are the sounds recorded in the sampler. IAA works well with a large number of apps. BM2 had the best IAA Host ability on iOS. If an IAA Plug-In is an IAA-Generator midi needs to be fed to it manually (midi settings for the pad hosting the IAA). Unfortunately BM3 doesn't indicate which IAA's are Instruments or Generators (AUM does this). Did you see this video? I had abandoned iPad music few years ago because I was not happy with the workflow . After all the hype surrounding the BM3 release, I decided to give it another go. But it's still clunky as hell. Hope the guys fix all these issues, but then it only takes an OS update to fuc* things up again. We are still years away from a trouble free music making experience on iOS, I am afraid... it's a shame because there are some great apps, but as soon as you try to make them work together, trouble begins.....back to my computer I go.... good luck fellas! Whether it’s BM3, or iOS music apps in general, I see what works and what doesn’t. I use the former and exclude the latter. There’s stuff in iOS and BM3 that works. Mobile music-making is made possible and for a remarkable low cost. As BM3 gets updated, even more becomes possible. Expectations just need to be aligned with the reality that iOS is mostly designed for zillions of iPhone users, and the money users want to spend on an app is relatively small. IOS is just an OS, It is designed for the devices we are using, it works and so do most the apps, yeah BM3 has some teething issues, but i think running away from IOS and BM3 is a bit silly this close to day 1 release. I updated my answer before. Have aread again. Electribe will work. Even With IAA. You need to set midi output to channel 10 and drums are mapped to c1. Read it again, think I understand it now... thanks. No worries but maybe you know how to load iMS-20 and imaschine. I can get iMS-20 to load using ab3 but the sound is distorted but I have no luck using IAA. Imaschine does not show up at all no matter what.